Nematodes are the most prolific parasite on the planet. With more than 10,000 classified species worldwide, they can be found virtually everywhere — in soil, water, and inside plants and animals. Described as the “unseen enemy”, nematodes account for an estimated 14 percent of all worldwide plant losses, which translates into global yield losses of more than $100 billion annually, including $9.1 billion here in the U.S. Crop production problems induced by nematodes generally occur as a result of root dysfunction, reducing rooting volume and foraging and poor utilization of water and nutrients. The most widespread and economically damaging species for commercial vegetable crops are the root-knot nematode, Meloidogyne spp., and sting nematode, Belonolaimus spp. In just a single gram of soil, 1,000 plant-parasitic nematodes can survive and thrive. Typically, plant symptoms and yield reductions are directly related to pre-plant infestation levels in the soil. Beyond direct crop damage, nematodes can also predispose plants to infection by fungal or bacterial pathogens or transmit virus diseases – which growers know, contribute to a whole different subset of production risks. For years, commercial vegetable growers have been confined to using restricted use pesticides, primarily fumigants, for nematode management. And as growers have waited over 20 years for a new solution to an old problem, they have lost use of methyl bromide (under the Montreal Protocol) along with several carbamate and organophosphate nematicides. With the number of nematicide alternatives shrinking, growers have been forced to battle nematodes with tools known for application headaches, high costs, and restricted use guidelines. Adding to grower frustration are increased populations of nematodes, pathogens and weed populations in fields treated repeatedly with methyl bromide. 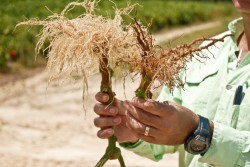 In a growing number of vegetable production regions in the U.S., root knot nematode populations are aggressively spreading, requiring additional chemical and nonchemical treatments in order to provide the most basic of protection levels. University experts have been alerting the market that more pests are yet to emerge and that the challenge for effective control will hopefully come in the form of new technology sooner rather than later. In September 2014, a long-awaited breakthrough for new nematicide technology arrived with the announcement that NIMITZ™ received federal registration from the EPA with approved crop use on cucurbits and fruiting vegetables. As the first new chemical nematicide to be introduced in more than 20 years, NIMITZ is the only nematicide that can deliver quality performance in combination with simplicity and improved safety characteristics. As the first product of its kind to have the least restrictive signal word of ‘CAUTION’ on its label, growers avoid public hazard and complex regulations associated with fumigant nematicides. This also means personal protective equipment requirements are less complicated – requiring only a long-sleeved shirts and pants and chemical resistant gloves. And, no more time-consuming Fumigant Management Plans, 24-hour field monitoring and restrictive buffer zones. Unlike older chemistries, NIMITZ is not a fumigant. The active ingredient is distributed through the soil and into contact with nematodes through water movement via irrigation or rainfall following application. NIMITZ application options include drip-injection, and broadcast or banded with mechanical incorporation. In regards to how it works, NIMITZ is a true nematicide which kills the target through direct contact rather than temporary paralysis (nematostatic) as seen with older organophosphate and carbamate chemistry. The active ingredient in NIMITZ acts quickly. Within one hour of contact, target nematodes cease feeding and become paralyzed. Within 24-48 hours, the nematodes are dead. Killing versus immobilizing nematodes is a fairly new paradigm for commercial vegetable growers which should drive a lot interest for trial use in year one. Product development for NIMITZ was 10 years in the making. With more than 1,000 field trials and hundreds of regulatory studies in 23 countries, NIMITZ has consistently demonstrated equivalent control to the best commercial standards. Of the seven main alternatives to NIMITZ used in the last five years, six are soil fumigants, including methyl bromide, and the seventh is a carbamate. All seven are Restricted Use Pesticides, which the EPA has cited as posing a greater risk to human health than fluensulfone, the active ingredient in NIMITZ. Restricted Use Pesticides require special applicator training and certification, reporting and record-keeping and additional restrictive labeling to protect against human exposure. The first registration for NIMITZ includes cucumbers, watermelons, cantaloupe, squash, tomatoes, peppers, okra and eggplants with a secondary crop tier to be submitted in 2015 for potatoes, strawberries, carrots, tobacco, sugarbeets and turf. ADAMA, the manufacturer for NIMITZ, has filed for registrations in 10 vegetable producing states including Florida, California, Arizona, and Georgia, with more states and crops to be added in the near future. In the short term, NIMITZ is going to create an important ‘step change’ for helping growers who want to move away from Restricted Use Pesticide fumigants. And with a new formulation that is lethal to nematodes versus causing immobilization, NIMITZ is an effective control strategy to combat the billions of dollars in annual crop losses due to nematode infestations. For more information about NIMITZ, contact ADAMA at 866-406-6262 or visit adama.com.